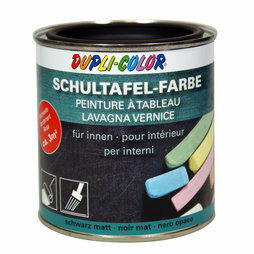 The blackboard colour from Dupli-Color is a special varnish that creates surfaces you can write on with chalk. It adheres to different base surfaces (wood, metal, plastic that can be varnished, smooth wallpaper, bricks, stucco, concrete). The paint itself is not magnetic, but it can be combined with magnetic paint. Note: The magnetic paint needs to dry for 2 weeks before the blackboard paint can be applied on top of it, which prevents textures for on the surface! After the blackboard colour completely dried the first time, wipe the surface with a damp cotton cloth until there is no more residue on the cloth. Here a nice combination of magnetic paint and chalkboard paint: Put two coats of magnetic paint on a wooden disk, then apply one coat of chalkboard paint. Let it dry. Now you can use chalk as well as magnets on the disc. Note: Contrary to the information in the video, the magnetic paint needs to dry for 2 weeks before the blackboard paint can be applied on top of it, which prevents uneven textures! If you combine chalkboard paint with magnetic paint there is no limit to your creativity: Use magnets on the same surface you write on with chalk. Especially fitting for the kitchen: Hang up your shopping list on the painted wall and make notes next to it with chalk.